But a paper that I recently saw presented at the 2016 CHI Play conference put an interesting spin on this: do NPCs in a game ever count as an audience? Do we think of them in that way enough to trigger the audience effect? There’s actually some precedence to think so. In one 2008 study3 researchers actually found that that little obnoxious paperclip helper Clippy from Microsoft Word could be seen as judgy and condescending enough to impede performance on difficult typing tasks. The CHIPlay paper by Katharina Emmerich and Maic Mauch is entitled The Influence of Virtual Agents on Player Experience and Performance4, 5 In it, the researchers created a simple game where you pilot a spaceship through an asteroid field, avoiding or blasting obstacles and scooping up items. Because they wanted to test the effects of spatial presence (that is, the feeling that you are in fact “there” in the game world) on the audience effect, they had both a virtual reality version of the game played with an Occulus Rift headset and a less fancy version played on a monitor. 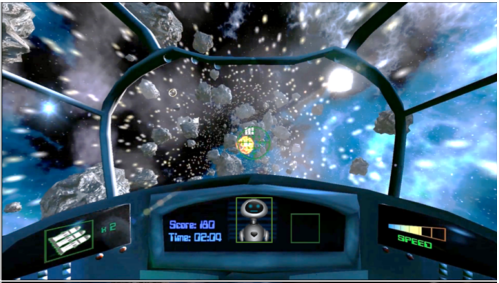 Screenshot of the game used in the study. To test whether an NPC could trigger the audience effect, the researchers created a cutesy little robot character that would either be present or not on the heads-up display, depending on what experimental condition a given player was in. So for those of you into experimental design jargon, they had a 2 (VR or non-VR) by 2 (NPC audience or no NPC audience) design. They then looked at players’ game score under various conditions. The robot NPC agent. Let’s call him “Dieter.” Why not? In a lot of ways this was a preliminary study.7 But it raises some interesting questions that can be addressed by more research. Do people attend to the NPC more when playing in virtual reality because they are more immersed and feel more spatial presence? Does dealing with all that VR tax their mental reserves such that a significant bite is taken out of the remainder by the otherwise innocuous little robot friend? In a way, this study could be interpreted as supporting the idea of the audience effect as described in other studies. I’m also curious about if the effect would be stronger if the NPC were something more than a rather a mostly passive little robot sitting in the periphery of the screen. What if it said stuff about your performance? What if it cheered or sighed in exasperation while you played? What if the NPC were someone that the game had cemented as more important to the narrative and with whom you had formed some kind of affinity or at least familiarity? Would that exacerbate the NPC audience effect even more? Science should find out. Get at it, science. 2. see Sanders, G. and Baron, R. (1975) The Motivating Effects of Distraction on Task Performance. Journal of Personality and Social Psychology, 32(6). 956-963. 3. Byron Hall and David Dryden Henningsen. 2008. Social facilitation and human–computer interaction. Computers in Human Behavior 24, 6 (2008), 2965–2971. 5. “Agents” is researcher speak for NPCs in the vast majority of cases. They are basically characters controlled by the computer, as opposed to “avatars” which are controlled by players. Thanks for this article Jamie, the paper you are referring to was exactly I needed. NPC are an untapped source of game awesomeness, for the most part. Certainly in the GTA games one can interact, but in a negative way, but it was with Far Cry 3 that there was hope that one’s actions would somehow make the lives of the NPC’s better, besides doing side missions for them, for it was the freeing of the islands from the bad guys that one hoped would affect how the NPC behaved, and in a small way the developers reinforced this idea with more positive interactions like waving people as one passed by in liberated areas. Still, the game failed in fully capitalizing on this effect and potential reward the gamer might have enjoyed more. What’s really great, is that you took the time to write about the effects of NPC in the gaming experience. The potential is there, but again developers are too narrow minded to appreciate the potential and as is often the case in FPS the gamer is thrown into the battle from the start. Lets not forget how COD: MW2 with the slaughtering of NPC’s during the Airport scene met with serious backlash for the developer, so they do matter. Seems like more distractions make people less productive. These distractions don’t need to be audience members; virtual or otherwise. Hi, I recently discovered your blog, it is great. Glados from portal is the perfect example of NPC as audience.